I sure have. One of my worst happened when my wife and I went to an RV show. You’ve probably been in this situation yourself. There’s this coach that you really like, but its really expensive. And you wonder: how can I get the price down to where I can afford it? I know the price is negotiable, but why is the salesman hardly budging? You might even have done what I did in this situation. I went home and searched through my collection of RV magazines, looking for buying tips. I bought books by “RV insiders.” I scoured the Internet for RV information. I spent weeks on this, and I still came up empty. Yes, there are lots of little tips out there, but nothing really useful. Plus, a lot of the so-called “insiders” contradict each other. I couldn’t make sense out of all this. So I figured: who would know this information? Who could I ask to find this out? You’re not going to believe the dumb stunt I pulled next. I’m a freelance writer by trade, so I figured I’d approach this as a research project. I figured I’m not the only RVer who wants to know this information. So I actually went to RV dealers and asked some salesmen if I could interview them about the buying process. I told them I wanted to learn how an RV buyer could get a great RV that he’d be happy with, at a great price. I approached dealership management, too. I was frustrated. Gloomy, even. I knew the prices were way too high… but how could an average RVer like me beat the dealers at their own game? The salesmen and dealers had stonewalled me. So I realized I needed to find someone who knew the dealer game, but who didn’t care if he revealed its secrets. This seemed impossible. Then I heard about “Mr. X” (I’m keeping his name anonymous, for obvious reasons). He’s been in the RV industry for 35 years, most recently for 13 years as a dealer. He had just recently got out of the dealership end of the business. I contacted him immediately, begging for an interview. I told him I wanted to know exactly, step-by-step, how an RV buyer can get a great coach for the least amount possible. It took some persuading, but I finally got him to agree to “spill the beans” on the RV buying process. Now that he wasn’t in the game anymore, he was willing to share its secrets. I recorded the entire phone call! And you can ‘eavesdrop’ on it if you want to. “We ended up with 30% off the price, no charge for freight, no charge for dealers prep, and got every option we wanted at dealers cost. I would say listening to your interview with the ex-dealer saved us a minimum of $10,000.00. “Super, I would recommend your interview to anyone who is seriously thinking of buying an RV. By the way, at the end of the deal, I told the dealer that I had bought your tapes, and he offered to pay me for them, so he could find out how to defeat your plan. But, don’t worry, I didn’t sell them to him. Montana RVer saves $20,000, says “Can’t argue with results”! Kathy in Washington State saved $8,000 using Mr. X’s advice… before she even bought her motorhome! 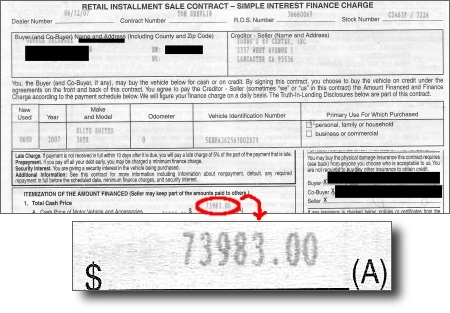 “We took [Mr. X's] advice about selling our old (1989) motorhome… [The dealer had] offered us $9,000 on trade and we had people lined up the first 2 days to give us $17,000 for it. It sold to the first guy who looked at it and there were others waiting in the wings wanting to buy it. “I never, ever, in all of my mmpphh years ordered anything like your product. I don’t believe in Internet ‘how to’ thingies and am always more safe than sorry. Something about your voice inspires trust and I admire you for making money by sharing knowledge; especially knowledge that I want and need. “My husband and I are seriously looking for a travel trailer but I have refused to buy one until I did some research and learned all that I could about the buying and negotiating process. We are the epitome of the ‘good cop/bad cop’ couple with me being, and really enjoying, the bad cop role. Now that I am armed with your information I am eager to get out there, at the end of the month of course, and buy that travel trailer. “I have just sat here, in this chair, for over four solid hours listening to your conversation and your tips. Despite the severe attack of sciatica I thoroughly enjoyed your tapes and will be happy to recommend them to friends. (after I buy my trailer…I don’t need the competition). Mark in New Mexico saved $7,912 on his RV: a discount of 31 percent! travel trailer, extended warranty, brake controller and equalizer hitch. I called multiple dealers after determining which manufacturer and model I wanted. The starting price was almost the same at all the dealers. “The starting price was $25,512 on average. I purchased the travel trailer with brake controller and equalizer hitch installed for $18,600. The brake controller and equalizer installed is about $1,000. So the trailer alone was $17,600. “I have only listened to the first 4 files…I find them very intriguing and am anxious to start shopping for a 5th wheeler. I am not quite ready to purchase yet…mostly window shopping, but some of the things you described what the dealer/salesman would say and do have already happened. “I went out last Saturday before I received your information, and the salesman had me by the short hairs before I had seen 3 models. Very pushy and had an answer ready for every question… and the answers were modeled after the information I provided from the start. I wasn’t happy with the experience so when I saw your offer, I was anxious to hear what you had to say. “I am going to finish the phone call and read the transcript completely through and then go out into the battlefield, armed with your information. I expect to be pleasantly surprised and I’ll let you know what I find out. “I found the interview very interesting and should be able to go into the dealer with the facts and the right attitude to purchase our next RV. Your files give me the right questions to ask and when to keep quiet. I’m sure we will save money when we buy. “I have found the information to be useful in two ways. As a first time RV purchaser I had no idea of how to approach the process of buying. Your information was very helpful in providing me with a framework and therefore a foundation of confidence on which to move forward. Your written summaries are very well designed and made it all come together for me. Wife and I have just began our search for an RV. We haven’t had one for 17 years now but had more than I can remember in the 70′s and 80′s. I signed up for your recording and bonuses as a refresher course on buying. Have listened to it enough to know it is going to be a big help in our buying at the right price… I will be listening to the recording for more pointers. I do agree from my experience that you should be congratulated for putting this together for those of us who like to save our money. “Wife retires at end of this year and we will be buying a Class B for our travels. We are very conservative and will be targeting a purchase no more than $20,000, used of course. 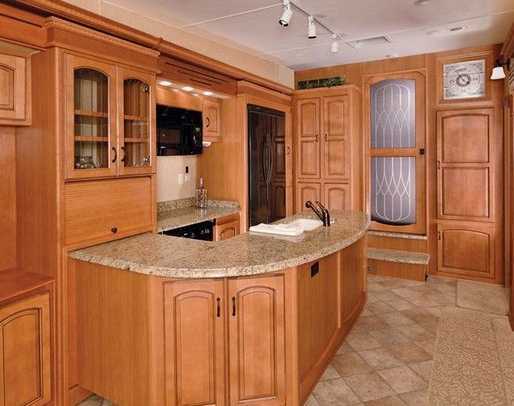 I’m already retired and who knows I may want to get back into buying and flipping RVs again. Buying an RV over eBay—a good idea, or not? Here’s his “insider” perspective. The best times of each month to buy, and the best times of each year to buy. You can get shockingly low prices if you time it right. How to get the dealer to drop his price once, twice, again and again…without even haggling. The single biggest mistake people make when buying an RV. Hint: it has nothing to do with price, or the size or type of RV they choose. Depreciation: how much value will your RV lose in its first year, its second year, and so on? Which RVs lose their value the fastest? Which hold their value the best long-term? The factors that affect depreciation. You walk onto a dealer’s lot. The salesman greets you and casually asks, “What kind of coach do you have now?” Is he just being friendly? Nope—this is the first step in OVERCHARGING you for an RV. Here’s what he’s doing, and how to stop it from happening. Pros and cons of buying a new RV. Advantages and disadvantages of buying used. where he lost $2,000-$3,000 on the sale! “Give me your cash price”—some RVers think this phrase will get them the lowest price. This is 100% wrong—here’s why this sentence might cause the dealer to increase his price, and what you should say instead. How to tell if a warranty contract is good or bad. What to look for in the contract. You walk onto the dealer’s lot. Here’s the first thing you say to the salesman, and what specifically to say during the negotiation. Uncomfortable with haggling? Mr. X described how to get the dealer to drop his price to just above his cost—or maybe even below cost—without going back and forth with offer/counteroffer etc. Insurance—what to watch out for when buying an RV policy. Things to watch out for when insuring a motorhome. Things to watch out for when insuring a towable. Extended warranties—whether to buy one, who to buy it from, which deductible is the best deal, and so on. Dealer add-ons: are they a good deal, or not? How to tow a dinghy behind a motorhome. Safety issues you need to be aware of. How to safely tow a trailer or fifth wheel. Mr. X describes a situation where he was towing a trailer on the highway at 75 miles per hour, and it came unhitched. He was able to safely stop both his truck and the trailer without any damage. A friend had the same situation but wrecked both his truck and his trailer (although he himself escaped serious injury, fortunately). Here’s what Mr. X did during the emergency that made the difference. By the time we were done with the call, my mouth was hanging open. Then I got madder than a swarm of hornets! I realized that if I hadn’t gotten this information, I would have been ripped off for tens of thousands each time I bought an RV! It’s not right that dealers do this! Yes, dealers have to make a profit. But I now know that the profits they usually make are just plain outrageous.That’s when I knew I had to make this information available to other RVers too. I’ve created a secret website and put the Mr. X recordings on it. You can listen to the call right over your computer speakers. Think about your ‘dream RV’ for just a moment. Now imagine saving up to 37 percent of your dream RV’s price. I think saying the recordings helped is kind of like asking “How would you like to save $44,000.00? Oh h***, let’s cut to the chase: Paid $73,983 AND they’re installing an ice maker and a few other minor items. I’m attaching a copy of the Retail Installment Contract. We put $0.00 down. Yeah, I’d say they helped. That’s a 37.3 percent discount from sticker price! Am I promising that you will save 37 percent on your RV? Of course not. Every deal is different. You might save less than George did, or you might save more. Either way, I’m convinced that if you apply Mr. X’s methods, you’ll get the best deal possible on your RV. Here’s my results – I’ve attached the factory option sheet from the Weekend Warrior CR3905 trailer that I bought. As you can see, MSRP is $60,892. In the first round of negotiations, I got the dealers down to $50,500. 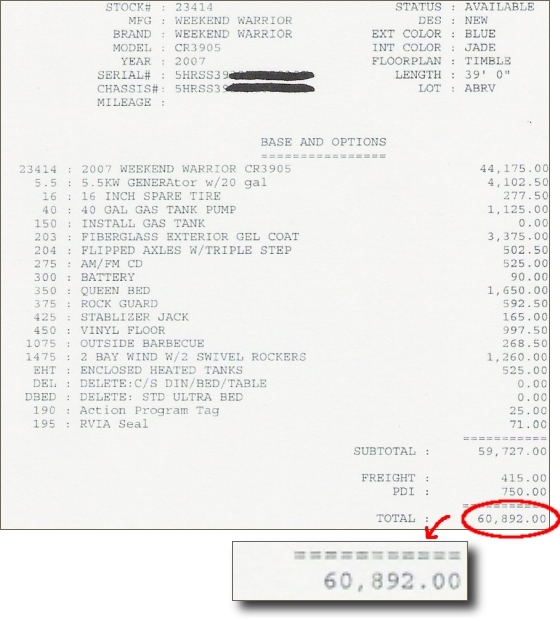 When I used the Extended Warranty call to the 3rd dealer, I got one of them down to $43,500. I used that info to go to one dealer’s lot that had one with an interior color that I preferred and got him down to the eventual purchase price of $42,900 for pretty much exactly the unit that I wanted. Total savings off of MSRP = $17,992. For the extended warranty – we got a 7-year, all major component, $100 deductible (per visit, not per system) with full roadside assistance for $2300. This was $300 better than the best deal I found from another dealer in my area. (using AT in IF, ID). I purchased a brand new travel trailer, extended warranty, brake controller and equalizer hitch. I called multiple dealers after determining which manufacturer and model I wanted. The starting price was almost the same at all the dealers. The starting price was $25,512 on average. I purchased the travel trailer with brake controller and equalizer hitch installed for $18,600. The brake controller and equalizer installed is about $1,000. So the trailer alone was $17,600. Thank you for the information, it was one of the best investments I have ever made. I have lots more emails I could share, but you get the point. These recordings could save you thousands. I’ve had friends tell me I should be charging $200 or more for access to them. They’re probably right, but for now, I’m not charging this amount. I’m making the recordings available for only $127.00 $97.00. I’m sure you agree this is an incredible bargain. If you consider the fact that you can save thousands or even tens of thousands on your next RV, then this tiny investment is more than fair. Complete Transcripts of the Entire Interview! I tried to take notes during the interview. (That’s why you won’t hear me talk much during the recording — I was scribbling as quickly as I could.) But even then, I knew I missed some great stuff. Mr. X was just a fountain of information. So I sent the recordings off to be transcribed. It cost me $301.50 ($1.50 per minute of the recording), but again, I was glad to pay it. If I need to remember something Mr. X talked about, I don’t have to hunt through the recordings trying to find it — I can just flip open the transcript and get the information directly. If you buy the Mr. X. recording today, I’ll throw in a copy of this transcript absolutely FREE. You can download it to your computer and be reading it in just a few minutes. Now you don’t even have to take notes while you’re listening to the interview! You’ll already have the entire thing in writing, word-for-word. Mr. X talked about financing during the interview. However, as I listened to it later, we didn’t summarize the process when we were done talking. Also, there were some things that didn’t make it into the recording — tips that I’ve learned from other experts, and a few resources that Mr. X didn’t mention. So I created a bonus recording that explains how to slash your financing costs. It lays out an easy three-step process to finance your RV for the lowest possible amount. It also gives you a list of Internet resources to help you do this. This recording, and the accompanying transcript, are yours FREE when you buy the Mr. X interview today. Many RVers have a trade-in when they go to buy a new coach. But most don’t understand the secrets to getting the highest possible amount for it. Many RVers get ripped off and taken advantage of by unscrupulous dealers, who give them far less than the coach is worth. That’s why I created this special bonus, based on what Mr. X and other experts have told me. It explains a three-step process to getting thousands more for your coach than the dealer would otherwise have given you. First I show you how to discover the current value of your used coach. (The NADA guide sells this information for $105, but I show you how to get it for FREE.) Then I’ll show you how to get the full amount for it. This bonus comes as a recording and a transcript. The transcript also contains special “screen shots” of Internet web sites, walking you through the process step-by-step so you can see exactly how to use the Internet during this procedure. And it’s yours FREE when you buy the Mr. X interview. When you’re standing inside a sparkling new coach, ready to buy it, you don’t want to think about the repairs it will eventually need. Or worse, the possibility of getting into an accident with it. But these are important topics you must think about. Plus, as with other parts of the process, the dealer will try to take more money from you than he should. This bonus recording talks about saving money on an extended warranty and several different kinds of insurance. You can save hundreds of dollars per year, for each year you own the RV, if you apply this information. And this recording, along with its transcript, are yours FREE if you buy the Mr. X interview today. Still not sure? You can always take the recordings for an 8-week “test drive.” If you’re unhappy for any reason, you’ll get 100% of your money back. If you’re not happy, I’m not happy. I’m making these recordings available because I want to help people save thousands on their next RV. So if you’re not happy with them, then I don’t expect…or want…to keep your money. Take your time listening to the recordings. Leaf through the transcripts and bonuses. Soak everything in. Take up to 8 weeks — you could even go through the entire interview and all the bonuses multiple times if you wanted. If you don’t think you can save at least $7,500off your RV with the information in these recordings, then I don’t want to keep your money. It’s that simple. Just dash off an email to me, and you’ll get a quick, cheerful refund of every penny you paid. But… the recordings and bonuses are yours to keep no matter what, as a “thank you” gift from me! So you really can’t lose. The recordings and bonuses are yours no matter what! Hate Mail from RV Dealers! As I said, I put up this site to help other RVers. I hadn’t expected a firestorm of angry protests from RV dealers. What do you think about the way he refers to us RVers? His email went on and on like this, including complaints about my “bull****” negotiating tactics, and other comments I won’t repeat here. Obviously I’m hitting home with this information. The RV dealers don’t want you to know these things. Unfortunately for them, I think you should know these things. So click on the link below if you’d like to get equipped to save thousands on your RV. I wish you great success on your RV purchase…and I’ll see you on the road! P.S.Want the recordings on CD? For a limited time, I’ll throw in FREE mp3′s of the entire interview, and all the bonuses too. Now you can burn the recordings onto CD, or even listen to them on your mp3 player if you want. You don’t have to sit in front of the computer to hear the interview — you can listen at your leisure, from wherever you want. Here are questions and answers about how this works. P.P.S. You have nothing to lose with my 100% Risk-Free Guarantee. I reserve the right to stop selling these recordings at any time. I don’t enjoy hate mail, and I’m tired of getting pressure from dealers. (I’m sure most dealers are nice, but they aren’t the ones sending me these emails!) If I take this site down, there will be no warning given. NOTE: We use Clickbank to process all orders. Clickbank utilizes the strongest security and anti-fraud features available on the Internet and never stores your financial data on their system. Your credit card data is passed directly to the bank and no one but the bank has access to your sensitive information (not even me). Why Your Credit Card is Safe. © Copyright www.rvsleuth.com. All Rights Reserved.